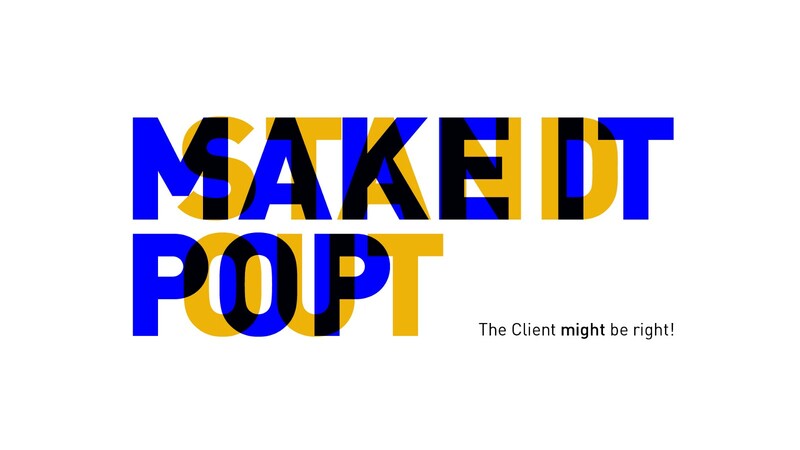 The Client might be right! This is my first post on medium, a little disclaimer — writing is not a skill I mention in my CV, so please do not mind my limited vocabulary or mediocre sentence formation. I am a 21 year old trying to learn, understand and practice design and I consider myself lucky enough to have worked on a few projects over the years. This post is about a change in the point of view I had,have or will have towards clients. During my initial projects I always thought I have a superior sense of design than everyone else and what I am making will work and look good. But the feedback and changes suggested by the client always demotivated me and as a result made me angry. “How can red look good on this background?”, “This will never work!”, “This will make it look ugly” were some of the phrases I always used either inside my head or in a counter argument. Similar thoughts, statuses and outbursts are in abundance over the internet. Where designers curse or mock the clients and the changes they suggest (some of them are really funny). I am not saying they (designers) are wrong but here is a little thought that now crosses my mind every time anyone is giving me a feedback or suggests a change on my work. We might have better knowledge of design and aesthetics but the person(Client) giving the feedback is not always wrong. The suggestions he/she gives can in every way really ruin the design. But if you look deeper and understand the thought behind that suggestion; is the point that has to be noted and worked upon. In my opinion we can be open and not love the design we just crafted with love (this is a separate blog post) and listen to understand the person or the company for whom we are making it. If they are suggesting something, obviously no matter how ridiculous it seems there is a thought behind it and if we can understand that, think about it, argue or work on that thought rather than the change he/she suggested. Then in my humble opinion the work we do will reach a higher potential and communicate to it’s audience in a better way. Next time someone asks you to make that colour pop, change it from red to yellow or white to black, “add an image there”,change the font. Then notice and understand why he/she is asking for it. Is your design not communicating right or projecting a different personality than what your client wanted? Maybe the request to add an image or fill up that negative space with more content could just be a request to make the message in your design clear.